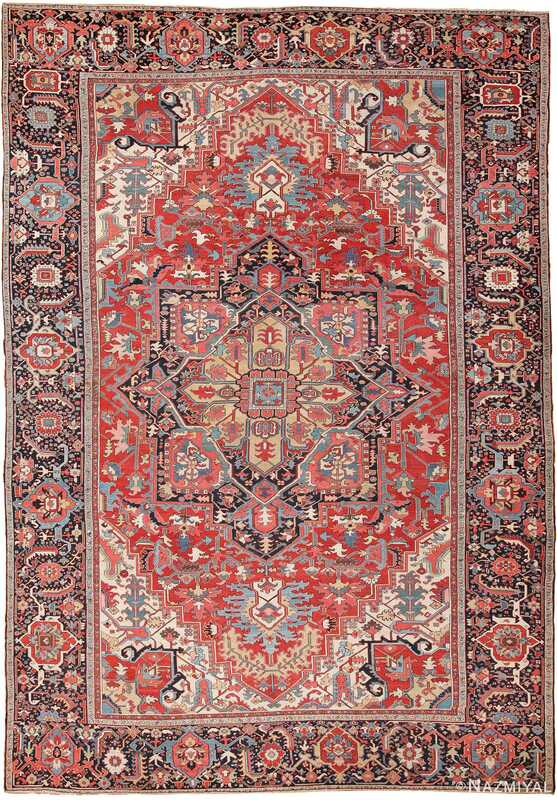 Spectacular and Unusually Fine Weave Large Size With Jewel Tone Colors Antique Persian Heriz Serapi Rug, Country Of Origin / Rug Type: Antique Persian Rugs, Circa Date: 1900 -The magnificent jewel tone colors and classic tribal style of this antique Persian Heriz Serapi carpet would make a spectacular addition to any traditional or modern interior home design. 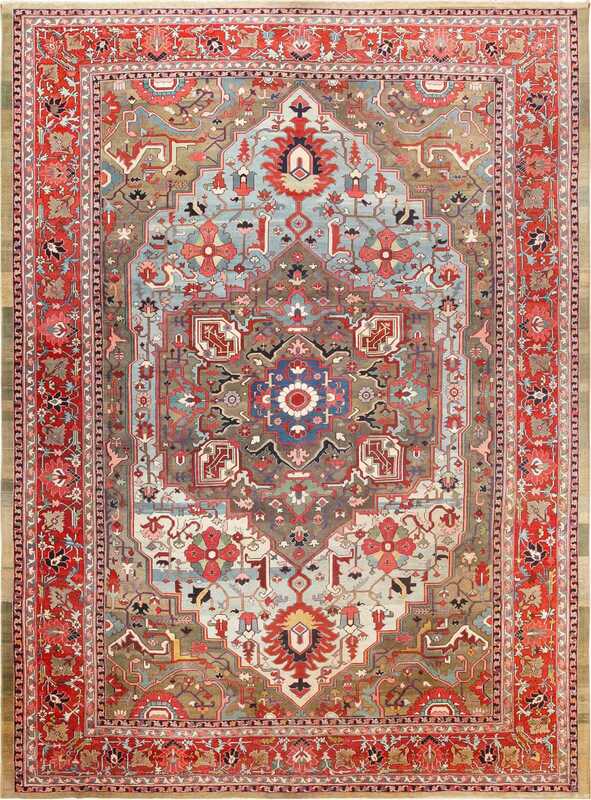 The first thing that draws the attention is wide range of crisp happy color that were used to create the details, background and design elements of this truly magnificent antique Persian Heriz Serapi rug. 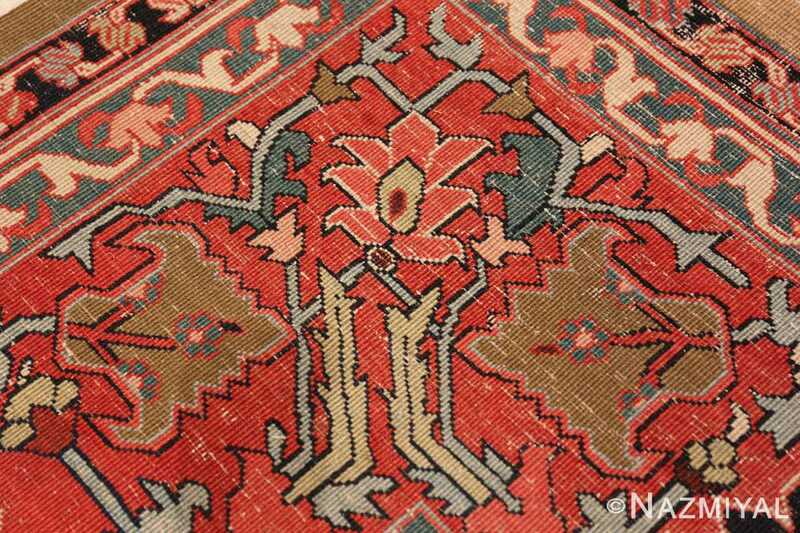 The warm reds, brilliant pinks, soft blues, earthy browns and ivory give this exciting antique Persian Serapi rug a vibrant character. 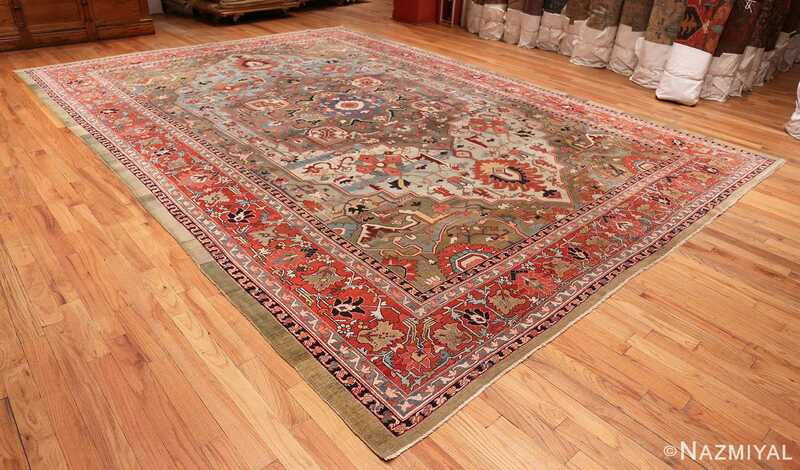 The design is a wonderful amalgam of classic and more modern approach to Persian Heriz rugs. 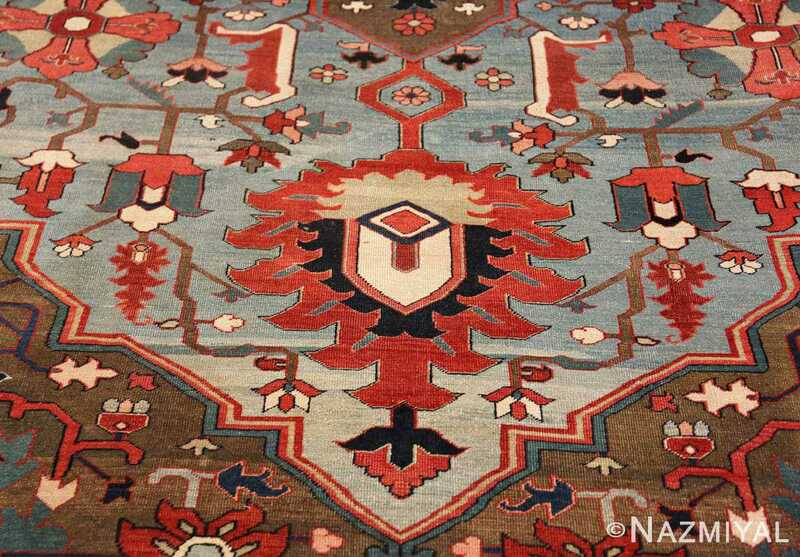 The classic central medallion design that radiates out into increasingly wider medallions is given a more contemporary feel due to the phenomenal use of upbeat rug colors. 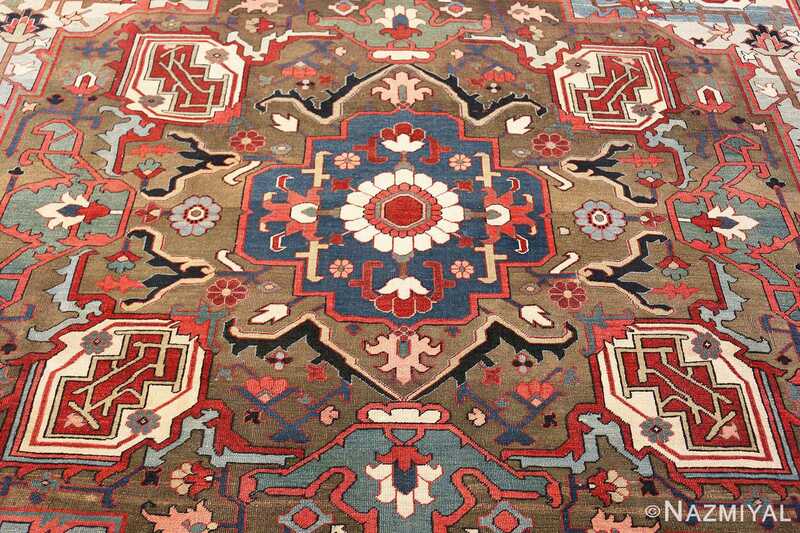 The geometric medallions divide the field using backgrounds of contrasting colors, drawing the eye to the center. 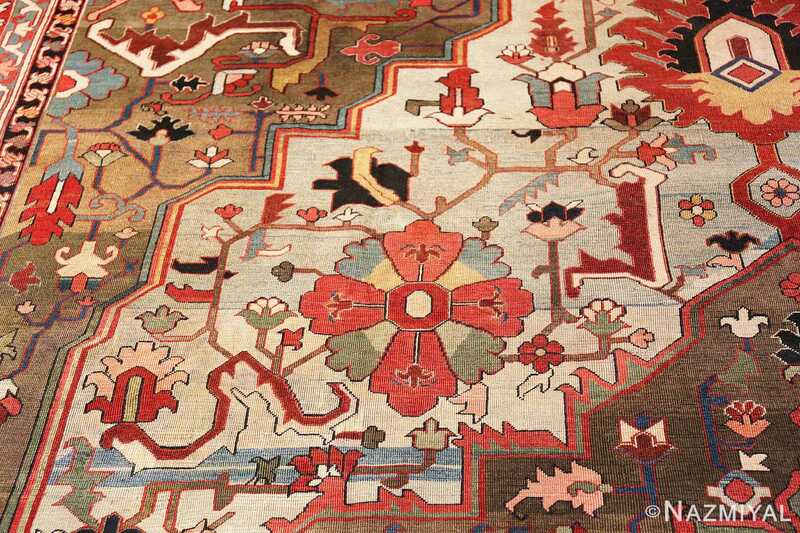 Many of the designs of Heriz resemble the antique tribal rugs of the Caucasus Mountains in the motifs that are used and the variety of breathtaking colors. 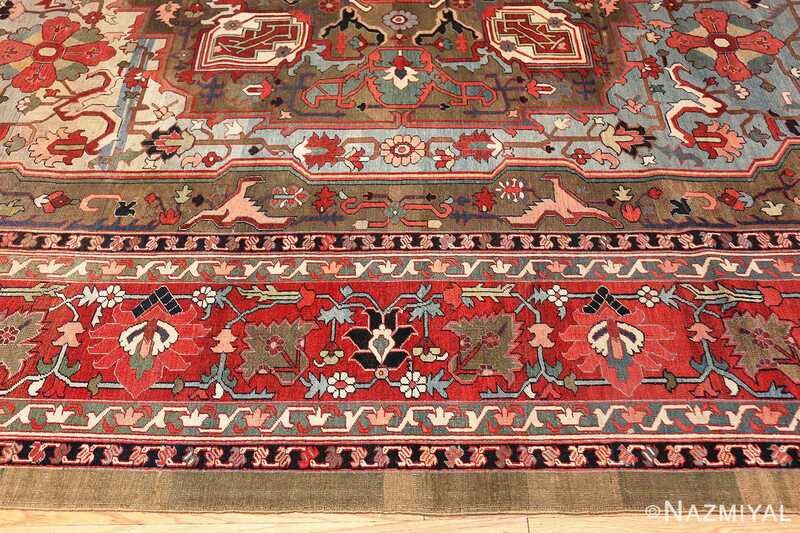 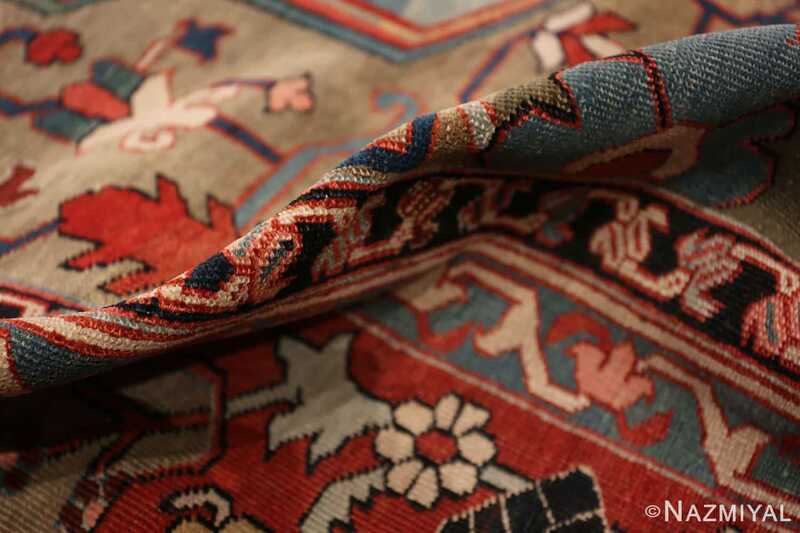 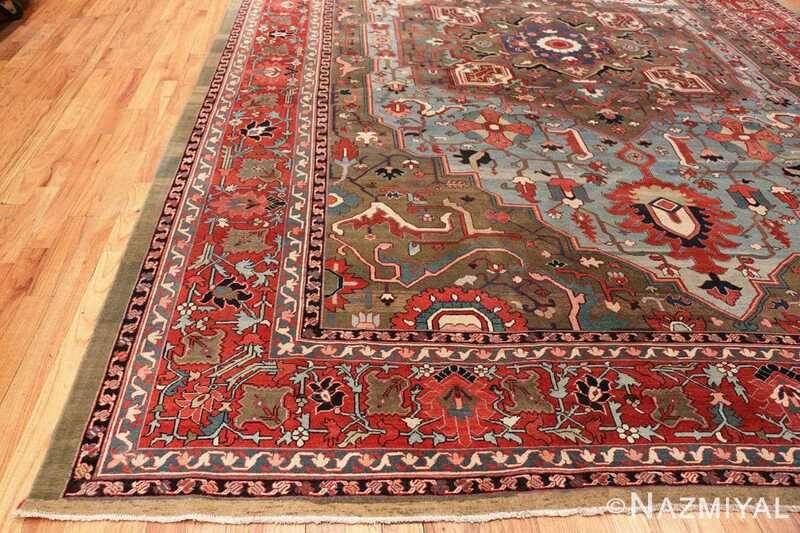 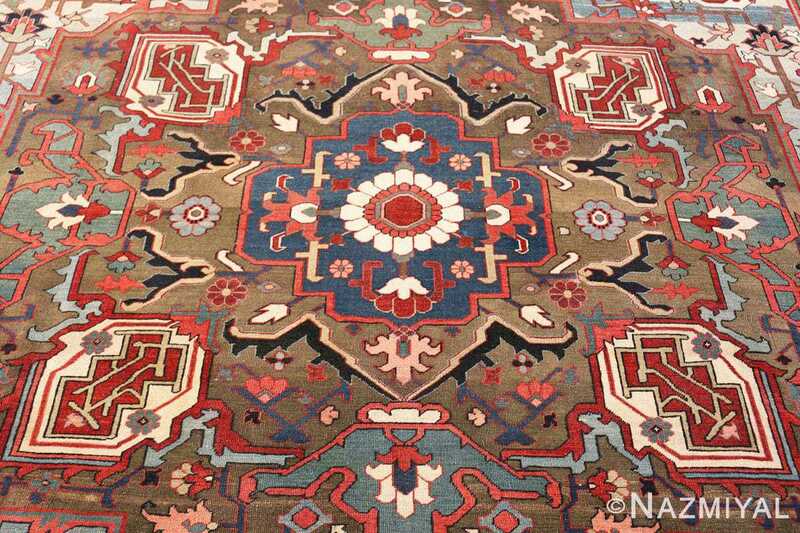 Serapi is a trade name that is given to many of the Heriz rugs of better quality that were woven before 1900. This antique rug demonstrates the characteristics of traditional antique Persian carpets in the formal layout of the design but has a uniquely tribal quality in the execution of the motifs throughout. 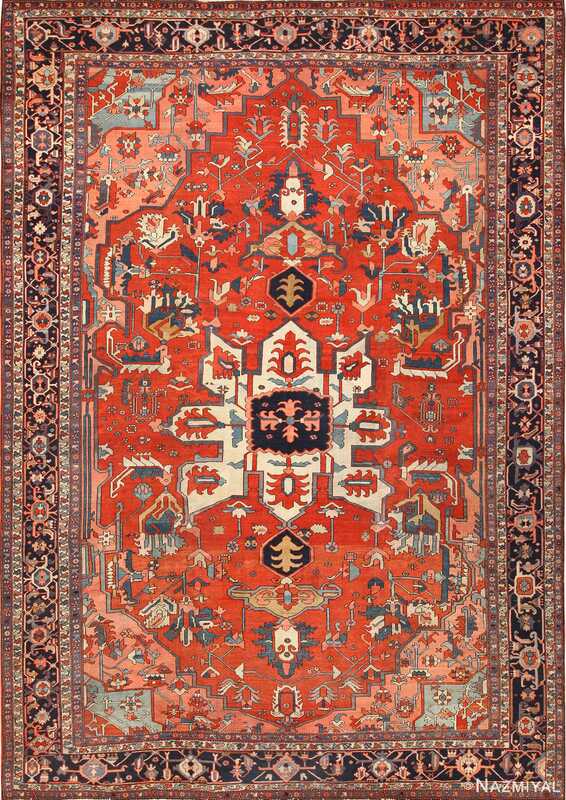 The main border of this captivating Heriz Serapi rug is proportioned to draw attention to the field of the rug. 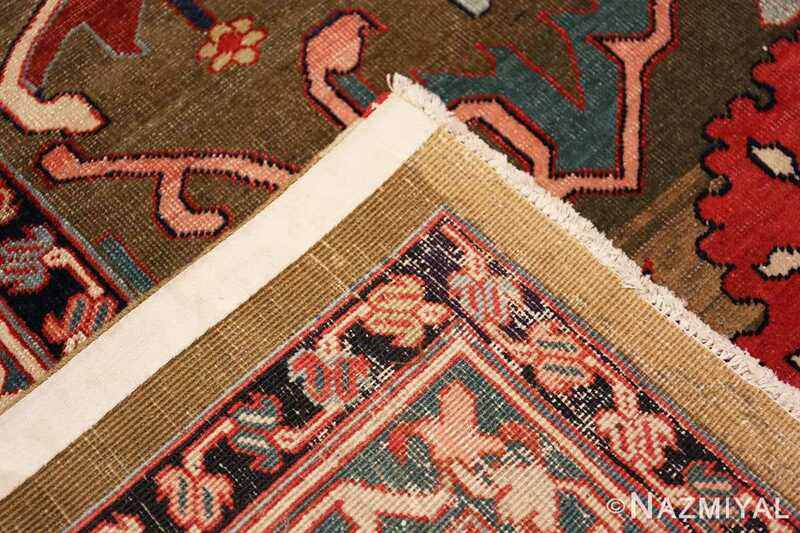 It carries the style of the design through the borders, making it appear to be an extension of the field, rather than a separate design element. This gorgeous and unique antique Persian Heriz Serapi rug would make and excellent addition to any home or office that needs a piece that is not afraid to make a statement in a traditional setting. 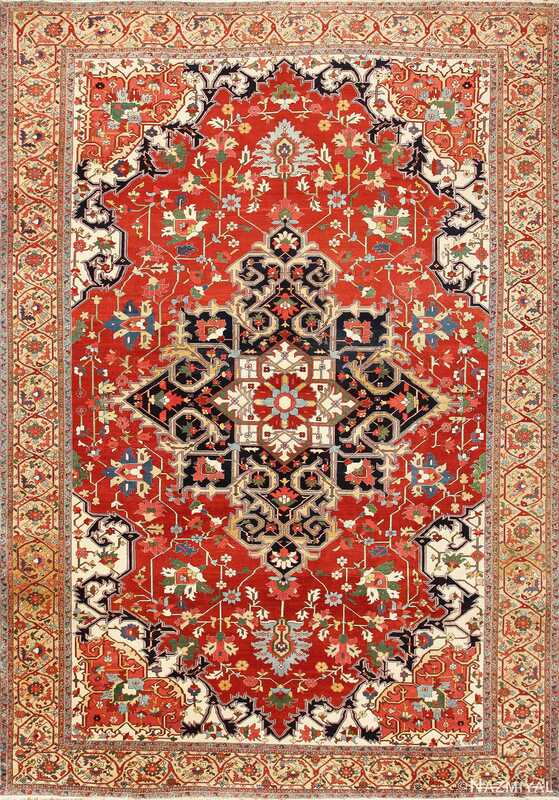 This Heriz Serapi rug is the perfect addition to a modern design where it will easily become the main attraction of the room.